Well, I did buy one Singer 4432 Heavy Duty sewing machine on sale. It was returned to the store as soon I came back into town. So sad…so frustrating…I gave up on it after working on one bag. Ripping seams more than sewing is not fun or productive. And it was happening every time I got to the most difficult NORMAL part of bag assembly process. The last thing needed was to add more than normal frustration to a step I already consider a wrestling match. I could have loved this machine. Love the needle threading feature. It did much better than my old Elna sewing over thick seams. Everything was going well until I had to adjust the position of the needle in the middle of stitching. It needs to be done at the bottom corners. A few stitches after turning the corner, a really ugly scraping sound comes up from below. Another inch of stitching and then nothing moves. The bobbin clogged with thread. Threads have to be cut from below the fabric. I was hoping I just bought a lemon. But online research did mention problems with the bobbin case clogging. I’ll look at the Juki next week. The same machine was $40 cheaper at another store. I decided it was worth trying again. Good news, no problems with the clogging bobbin. It topstitched beautifully except the brute force sound of the needle pounding through thick layers. It doesn’t sing like my old Elna. In the tradition of my second cousin naming her inanimate objects and in honor of her grandfather, this machine will be known as Henry. I think I will get a second one, so Henry will have a twin brother. Henry has put me back in business. This entry was posted in Sewing and tagged Bobbin thread, Juki, Singer 4432 on June 25, 2014 by slantedstitches. I’m neither zigging or zagging at the moment. The two sewing machines I’ve been using gave up within days. The Elna, I’ve had since high school was making a rhythmic metallic grinding sound. Cleaning and oiling didn’t make a difference. She went in last Monday to the repair shop. Fortunately, I had borrowed a Kenmore (Ken) from a friend when Elna gave up the zigzag stitch last year. After I made the gift bag, I cleaned Ken before starting the next round of bags. He didn’t like my cleaning. He decided not to feed the fabric as he was stitching. He went into the shop on Friday. No sewing machines…What to do? Catch up on data entry, scanning receipts, clean house, all the fun stuff I’ve been saving for later. And time to get this blog up and running. I had no idea the shop turn around time would be a week. Sigh. Ken is fine and back at the table, ready to work at his old spot. He just needed regular servicing. The repair guy said Ken’s a great machine. The service costed $159. I wonder if he says that to everyone. I would feel really bad if I killed my friend’s machine. Ken does work great for anything except vinyl. The plastic housing and vinyl stick together like magnets. And I did kill my Elna. As in “I have never seen THAT gear crack before. No replacement parts are available. We can’t fix it.” As in, jamming the needle like a jack hammer through the fabric is not a good idea. I was worried that I was pushing her too far. But I thought she was a super-machine and could handle it. We’ve been together longer than anything else, except my parents. We have traveled all over the continent. She created beautiful things for house and the family. Is that enough of a eulogy for a machine? But no time to weep. Time to think about a replacement. After checking out what’s available locally and online, I’ve settled on two possibilities and just decided on one of them. After a week to consult with family and friends and research online and mental zigzagging, I decided on cost versus dream machine. Call me practical. Singer 4432 Heavy Duty $290/$189 on sale (+ heavy-duty, +cost, + less computer) . I’ll pick this one up tomorrow. It doesn’t have the knee lift or needle up/down features. But it will perform better than Elna. Sammy will be his name. I might buy two Sammys, since he’s nearly the same price as a trip to the repair shop. Juki TL2010Q $1000 no sale (+heavy-duty, +knee lift, + up/down needle, + less computer) Juki will have to wait until I can afford her. She is still my dream machine. 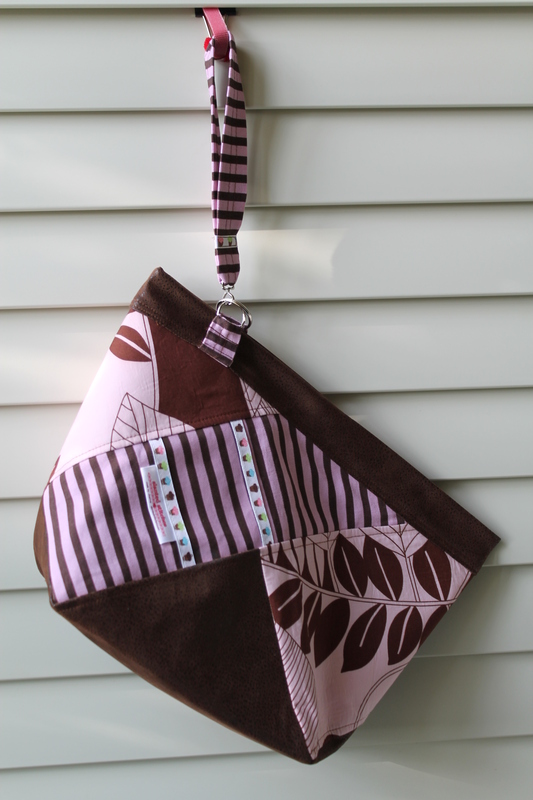 This entry was posted in Sewing, Zigzagging and tagged Juki TL2010Q, sewing machine, Singer 4432 on June 16, 2014 by slantedstitches. A new friend just moved last week. Sigh. Fortunately, I’m getting my sewing process streamlined. Sewed a knitting project bag for her in 2 days. Just before two of my sewing machines decided to go into the repair shop. What if we blog together? “You could chat about exploring the new town, your knitting and crafting/Etsy shop updates. Now to figure out how to do this…. I think we’ll temporarily call this segment, Double Needles. Double needles, in sewing, is a special needle that produces two parallel stitches on the top. Double knitting is a technique of using two strands of yarn at the same time, producing an image on one side and reverse image on the other. This entry was posted in Double Needles, Zigzagging and tagged blogging, knitting, sewing on June 10, 2014 by slantedstitches. Squarespace vs WordPress…graphics, themes, branding, photography, writing.√,√,√,√, needs work but tentative √….I think I can handle it. Ok, this looks doable. So far, so good. I think I can post something worthwhile once or twice a week. That’s 100 something posts a year. I have at least that much to say in a year. Then…SEO, affiliates, stats, ’email lists are gold’, daily posts…posting a blog a few minutes after delivering a baby. Now I’m filled with dread. Who are these people? I don’t have not enough ambition, not enough energy, not enough words to say, not enough ideas in my head, not enough of anything… to do what they do. Double panic, because the sewing wasn’t going well either. Do I REALLY want to be making these bags for the next few years. Do I REALLY want to be hustling? It was not a pleasant week. That week…the answer was NO. Mommy (Stepford Wives style or snarky style) bloggers, personal finance bloggers, coaching bloggers, How to blog bloggers. These seem to be the most vocal category of bloggers/podcasters. What world is this? Actually look at some of their blogs. Nearly every website crashes my antique ipad. I’m betting high memory load from flashing ads and pop up windows. I have been SO sheltered. I rarely go to blog websites. I read blogs through Feedly or Flipboard (no ads, only content and pictures). Oh…now it makes sense why Feedly crashes so often. Time to clean out my bloated list of subscribed blogs. and instead looked for knitting blogs. What a contrast. A breath of fresh air. This was better, more like visiting with a friend. OK, decision made. I’m staying somewhere in this group of bloggers. Going with WordPress.com for now. Ads are theirs, until I pay for no ads. I’m no longer struggling with the bags. And the only reason, I’ve started working on the blog (both my sewing machines are in the repair shop). what can I contribute, how can I benefit the collective? Why would anyone read my stuff? Then I heard something interesting….the Blogging Your Passion, Jonathan Milligan says something…he is amultipotentialite. What? There’s a name for that? That sounds like me! Do I follow the White Rabbit down this hole?